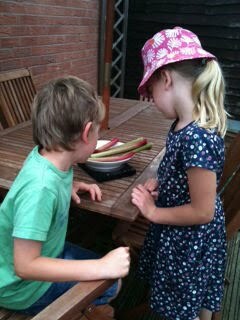 Each time the rhubarb starts to grow either the children stand on it or the slugs eat it. I decided today that we'd pick the young stems and use them before they got wasted. The cake we chose to make needed a pound of fruit. Above is a picture of the children weighing the stems as they were taken from the plant. It is now bare, I didn't realise a pound was quite so much. Preheat oven to 190 c. Grease an 8in round cake tin (I used a slightly larger square tin). Cream the butter and sugar together. Beat in the eggs then fold in the flour and a pinch of salt. Slice the rhubarb into 1cm pieces and toss in the demerara sugar. The children sliced the rhubarb using a Pampered Chef safety knife. Even the toddlers helped. To make the topping, rub the butter into the flour and stir in the sugar. This makes a crumble mixture. Pour the cake mix into the tin and arrange the rhubarb on top. Sprinkle the topping over and bake for 40-45 mins. Our cake is in the oven, I have realised I have made a mistake. I should have either used a loose bottom tin or left the greaseproof paper hanging out the sides to use to lift it out. I have no idea how I am going to get it out of the tin with the crumble topping. I'm hoping to make it to the shops before dinner to buy some ice cream to serve it with. Erm, not sure there is enough left to photograph. It was really nice warmed up with vanilla ice cream on top. Re: the topping, it held together better than I thought. I used an upturned plate to get it out of the tin then another plate to flip it over. I'd make it again, well if the rhubarb ever grows enough again. We've never had much success with it.